Congratulations Alice!!! 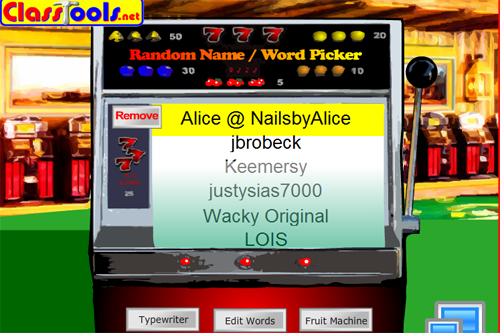 Alice blogs over at Nails by Alice so make sure you check her blog out. I've just sent you an email requesting your details Alice and please respond within 48hours! If I don't receive a response in that time period I will draw another winner. A HUGE thank you to lovely Kerry and Anna for providing this awesome prize! You can purchase Glitter Gal polishes from the online shop. oh thank you!! I'm happy! this really makes me smile a little! Congrats to the winner and thanks Michelle for hosting it.